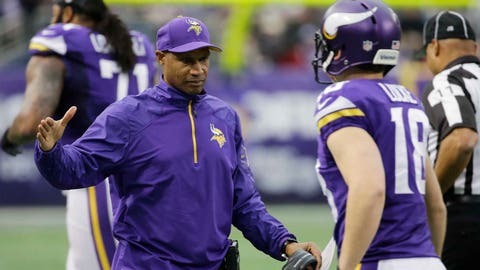 Vikings head coach Leslie Frazier (left) reacts with punter Jeff Locke during the first half against the Lions. MINNEAPOLIS — Leslie Frazier waited by the entrance to the Minnesota Vikings’ locker room at the Metrodome, waiting to say thank you to each player as they entered following Sunday’s 14-13 season-ending win. Frazier, the embattled head coach still unsure of his future, wanted to make sure his players knew how much he appreciated their efforts. Even in a disappointing season that began with losses in seven of the first eight games, Minnesota’s 4-3-1 second half of the season was punctuated with Sunday’s come-from-behind victory over the free-falling and uninterested Detroit Lions, which could be looking for a new coach of their own after losing six of their last seven games. "I just told them how proud I am of the way they battled, special group of guys," Frazier said of his message to the team Sunday. "There’s a lot of times they could have thrown in the towel, but they didn’t. They kept battling and today is great evidence of that." 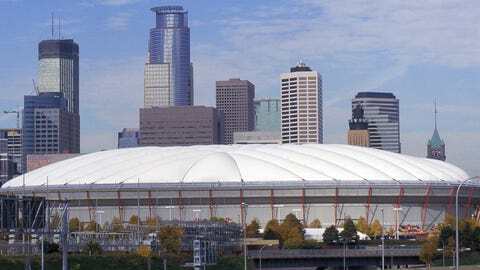 Frazier and the rest of the Vikings will have to wait a little longer to find out if the final game in the history of the Metrodome was also the last game of Frazier tenure in Minnesota. Owner Zygi Wilf avoided commenting on Frazier’s status after the game, though a report by FOX Sports’ Jay Glazer said Frazier will be fired. "I have nothing to say," Wilf said. "I’m going to enjoy, we’re all going to enjoy this win and move on." Wilf, headed to a postgame ceremony to commemorate the final game in Metrodome history, was pleased with the 14-13 win. "Basically I want to focus on that part of it because being here as our home, it’s very emotional and I’m very glad we left on a good note," Wilf said. Few expect Frazier — who has a 21-32-1 record in three-plus seasons as Minnesota’s coach — will last much past Monday. But Frazier didn’t go quietly on Sunday, noting he has a contract for next season and noted the roster deficiencies that led to the 5-10-1 record. "I have a contract," Frazier said. "Our staff has a contract for 2014 and I hope that the Wilf family will honor that, and give us a chance to come back next season and try to get our quarterback situation fixed, try to get the depth of our roster fixed, along with some other areas on our roster that need to be fixed. I hope they’ll give this staff a chance to finish what we’ve gotten started. Only a season removed from the playoffs, I think our guys are still playing hard and we’re under contract. So, we’ll see." A franchise worst-tying record of 3-13 in 2011 was followed by a seven-win improvement and a playoff appearance last season. But plagued again by bad quarterback play and a defense that nearly gave up a franchise record in points, the Vikings fell in the standings again and suffered from giving up the lead in the final minute five times this season. Minnesota used three different starting quarterbacks, prompted by the injuries and inconsistencies to hand-picked franchise quarterback Christian Ponder. Frazier reiterated Sunday he didn’t make the decisions on the quarterback alone. Ponder’s third season included two different stints as the Vikings’ starter. Signing Josh Freeman was a failed experiment and he ended up playing one game with Minnesota. Matt Cassel, who finished 20 of 33 for 189 yards, a touchdown and interception, gave the Vikings’ offense life, but he was often passed over for Ponder and Freeman earlier in the season. "When you’re talking about the quarterback position, you don’t make these decisions alone," Frazier said. "The quarterback position, this is a franchise position. So it’s a collective decision. At the end of the day, I’m the head coach. But when it comes to the quarterbacks, it’s not like inserting an offensive guard or a wide receiver or a tight end, that’s a completely different matter. So, believe me, there were discussions in each one of those situations." Frazier said he doesn’t concern himself with reports of his job status and said he’s proud of what he’s done as the Vikings’ coach. "I’ve done everything I can do in my tenure here as the head coach of the Minnesota Vikings," Frazier said. "I just know, as I mentioned earlier, in our league, you need to get that quarterback position fixed." While reports swirled about Frazier’s status, players again voiced their support for their coach. "I would be disappointed," tackle Phil Loadholt said. "I think Coach has done a great job here and is a heck of a guy, great football coach. I’ve learned a lot, so definitely don’t want to see him go." Longtime defensive leader Kevin Williams said: "He’s done a great job with us. When he stepped in a couple years ago, he got us a couple wins in that bad season. We had a playoff season last year. Wins didn’t go the way we wanted this year, but he’s hung in there and encouraged us well." Running back Adrian Peterson said he’s talked with ownership in support of Frazier and plans to meet with them again Monday. Frazier’s calm, steady approach has always resonated with his players. Peterson, for one, appreciated Frazier’s methods. "A lot of people like the rah-rah type guy," Peterson said. "I’m more about words and what’s being said. No matter how it’s said, you can hold on to it and learn from it. He does a great job of being a teacher. I feel like that’s what this organization needs." Frazier has the players’ support. Will it be enough for the Wilfs and general manager Rick Spielman to give him another chance? Frazier, a man of faith, won’t let it worry him. "I have a lot of belief in my ability as a coach," Frazier said. "I have a lot of belief in the guys on our team, a lot of belief in our staff. And for that reason, you don’t have to walk in fear. You just know that things are going to work out."